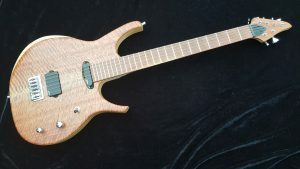 The guitar has a figured Eucalyptus top on a single piece, Swamp Ash body. 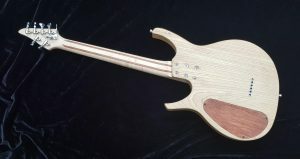 The laminated neck is a combination of Maple and Bubinga with a 10-14″ compound radius Bubinga fretboard. The guitar features passive EMGs, Hipshot Classic Open Tuners, a Hipshot Xtender and an ABM 3256 Modern Hardtail bridge. All of the Hipshot products and ABM Hardtail were supplied by yours truly. Go follow Sutch Guitars on Facebook! Thanks for the photos Jason.